The native clove currant, Ribies odoratum, grows beautifully in my area. It is sturdy, healthy, drought-tolerant, will tolerate some shade, suffers from no bugs or diseases, and is reasonably attractive, especially in spring when covered with thousands of tiny yellow flowers that have a soft pleasant scent. I haven’t found them growing wild in my area but I have a bush that was planted by birds; they grow that easily, and start to bear within three years. I have several large bushes and would have planted more if not for one major disadvantage: I thought the fruit tasted awful. The fruits, like most berries, are relatively low-carb for fruits and probably contain a good set of antioxidants, but eating things prescriptively rather than for pleasure is just not my style. But sometimes plants just have to hang around my yard until I learn to use them well. 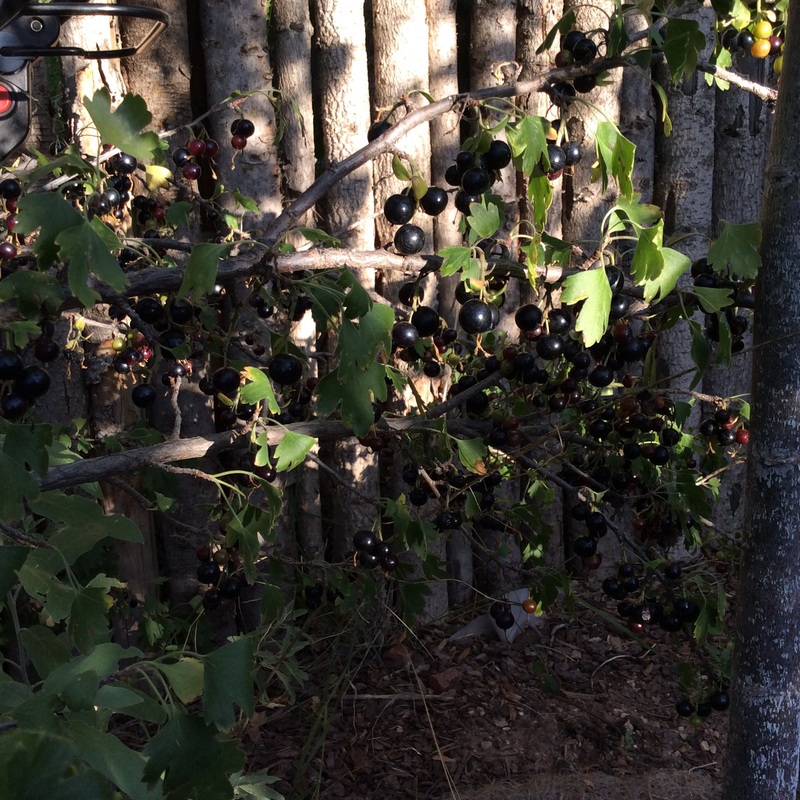 This year, after living with clove currants for five years, I finally figured out (duh) that the fruits are not ready to eat when they turn black. Don’t grab those first black shiny fruits. Leave them on the bush for another couple of weeks. Taste every few days, and when they taste sweet and spicy (still very tart but with a balance of acid and sweetness) they’re ripe. The fruits actually get a little smaller as they ripen, and some will look a bit wrinkled. Don’t worry. Don’t use any that are dry and shriveled, but a little loss of turgor just intensifies the flavor. I enjoy eating a handful in the garden when I make my morning rounds, but my favorite use for them is in cobbler. 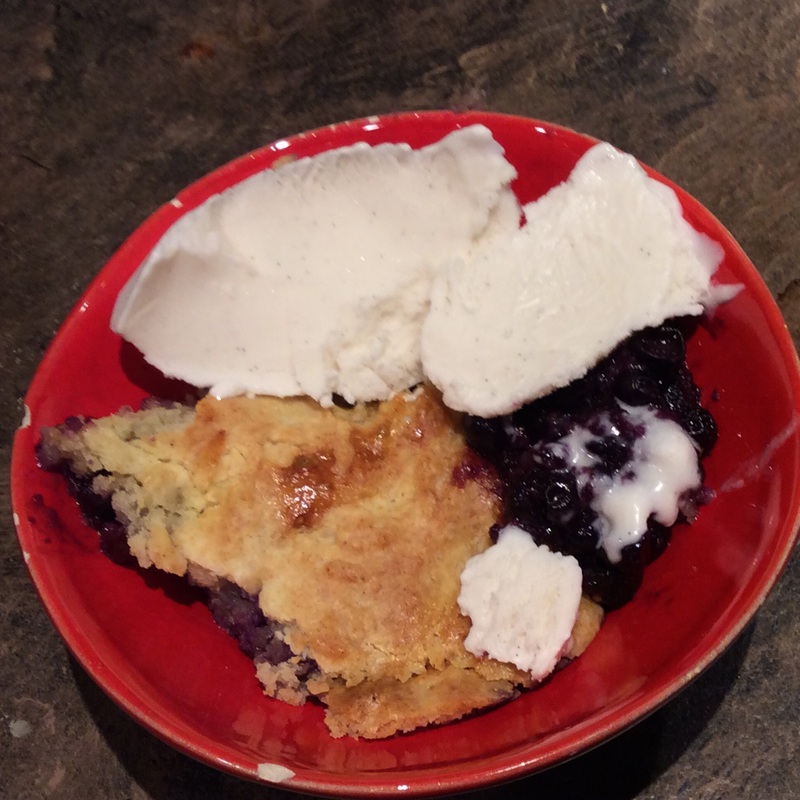 If you are low-carb, use my recipe for red, white, and blue cobbler, using clove currants alone or adding in some frozen wild blueberries to make up the fruit volume if you don’t have enough clove currants. Work the sweeteners into the fruit with your fingers, crushing the fruits a bit as you go. 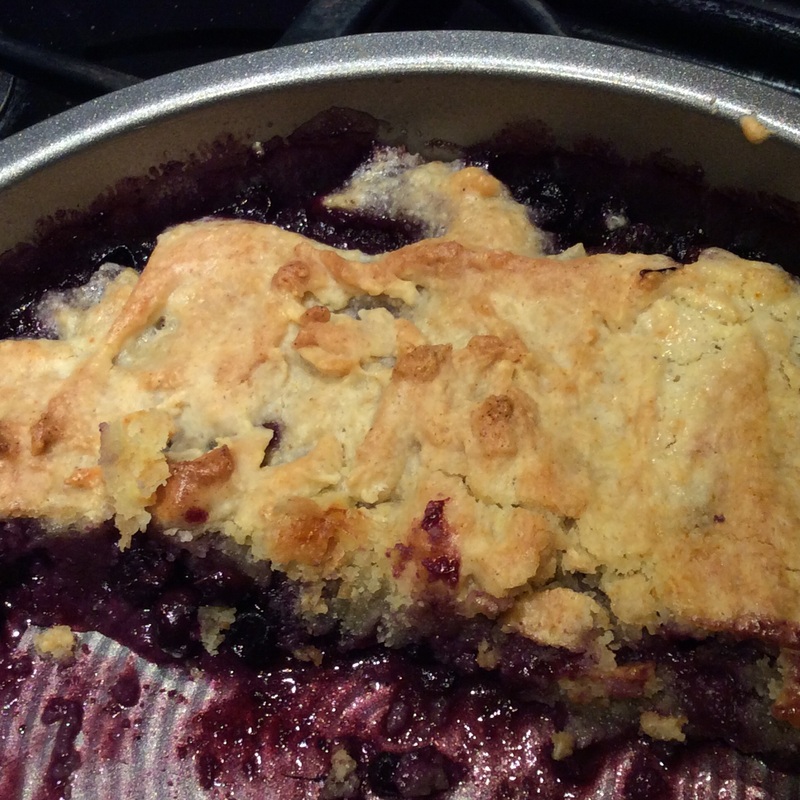 If you eat sugar and flour, just use your own favorite cobbler recipe. Be sure to grate a little fresh nutmeg into the fruit mixture to bring out the spiciness. The fruit clings to the stems and often has a little wiry “tail” clinging to the blossom end which has to be removed, so harvesting them is a bit tedious. I wait until early evening and then sit comfortably under the bushes with a bowl, pulling off stems and tails as I go so that fruits that hit the bowl are ready to use. I eat a few along the way. The laborer is worthy of her hire, after all. I’ve been thinking of other ways to use them, and I think that they might be good in sauces for meat and game. I can recall reading a British recipe for a blackberry sauce for venison, and along those lines I plan to try using clove currants for a sauce for roasted pork. But right now they are going into cobbler or disappearing straight down my greedy gullet. I also have a couple of bushes of Golden currant, also known as wax currant, but they are slower to bear and I haven’t had enough fruit to experiment with yet. More on that later. We love our ‘clove bush’ as we call it. It’s located near our greenhouse so in spring when we’re working in the greenhouse we can catch its smell wafting around. Often we can catch the smell as much as a hundred feet away. Lacking a pollinators, it’s never had much fruit. Now that I know how to eat them I might be transplanting one! Mine bloomed heavily for a year without setting fruit, then set a ton of fruit the following season. I have several bushes, all seed-sown or bird-sown, so I probably have a lot of minor genetic variation going on. The received wisdom is that currants are self-fertile, but our native Western gooseberry, Ribies uva-crispa, is known to show self-incompatibility unlike the British gooseberry, so I see no reason why our native currant shouldn’t also be more gregarious and outgoing than its British relatives. Lots of clove currents here in Santa Fe. I’m new to the area and tasted the fruit last year but was underwhelmed. After reading your article I realize I tasted them too early. Thanks for the tip. Hope you enjoy them, Ellen. Seems to me that it is usually about three weeks from the time I notice fully black berries to the time that they taste good. And by the way, bienvenido and welcome to New Mexico! I took a look at your website and sighed; chicken of the woods is one of my favorite mushrooms and I have never found it in New Mexico. I hope that you are luckier than I am. I haven’t found them in NM either, but I get back east several times a year, and always during a good foraging season, if possible. Out here it seems like it’s more porcinis and chanterelles…which aren’t too bad either!